In our latest CEE startup news recap we said that out of the deal between Naspers and a few private equity firms a new Unicorn emerged in Poland. We were wrong! 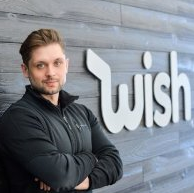 There’s another Unicorn co-founded by a Pole, an e-commerce platform Wish. San Francisco-based company Wish has recently been valued at $3.5 billion by venture capitalists. This November Wish raised $500M from Temasek, the investment arm of the government of Singapore. In February 2016 the company closed a $500M Series D round led by Russia’s DST Global and Yuri Milner. The round also included previous investors such as GGV Capital and Founders Fund. The total funding of the company equals $1,08B. The startup was launched in 2011 and now is one of the biggest mobile e-commerce platforms in Europe and America. In 2010 Peter Szulczewski, a former Google engineer, and ex-Yahoo! developer Danny Zhang founded ContextLogic, an advertising technology startup, and a year later pivoted it to Wish. Wish is a combination of a virtual shopping mall and an online flea market which has three popular mobile shopping apps – Wish (the core app), Geek (for electronics buyers) and Mama (for new mothers). The company offers a wide selection of clothes, footwear, accessories, and electronics directly from the manufacturers at low prices. Wish sellers are free to price goods and make discounts as they see it right, but a huge seller base helps keep the prices low. In their turn, low prices are kind of excuse for waiting one month for delivery. Wish uses state-of-the-art recommendation technology. The algorithm recommends consumers what goods to buy depending on not only what they bought, but also on what they looked through and rejected. The apps make it simple to find really cheap products, with some items being discounted up to 90 per cent. The marketplace has only a limited number of authentic brands just for price comparison, and offers mostly no-name items, so it’s not an attractive place for those who would buy counterfeit goods by wholesale. Wish currently employs about 1,000 people. It serves as an intermediary between 150,000 merchants – mostly China-based – and 160 million registered users across 70 countries. The company takes 15% commission for each of 6 million in daily sales.